Chinese tech giant LeEco on Wednesday organized its first major press conference in the United States, mainly to talk about new smartphone and television products. The event took place in San Francisco and was hosted by LeEco CEO, Chairman and founder Jia Yueting. LeEco made its name in online streaming but has since expanded into numerous areas in the tech industry. It now wants to launch electric cars with self-driving capability and has previewed what’s possible with the LeSee concept car unveiled in April at the 2016 Beijing auto show. LeEco is also the backer of California-based electric car startup Faraday Future, and at its press conference on Wednesday we learned from Yueting that Faraday Future will unveil its first production model at next January’s 2017 Consumer Electronics Show. The car is expected to be a spacious minivan-like model based on the now standard “skateboard” platform for electric cars, where the batteries are stored in a flat array in the vehicle floor. 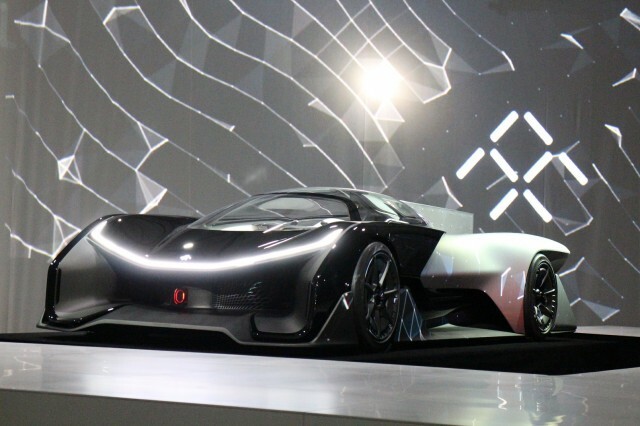 Faraday Future previewed the platform, dubbed the VPA, at the 2016 CES in the 1,000-horsepower FFZERO1 electric supercar concept. To power its electric cars, Faraday Future will rely on batteries developed in partnership with LG Chem. Faraday Future plans to build its cars at a plant in Nevada and will initially focus on the U.S. LeEco will focus on the Chinese market and will build its cars there. The 2017 CES runs from January 5-8 in Las Vegas. For more of our coverage on the event, head to our dedicated hub.